The latest new addition to the world’s top-10, Daria Kasatkina has one more chance to finish her season on a high when she takes to the court on Tuesday as the top seed of the WTA Elite Trophy in Zhuhai. The 21-year-old Russian fulfilled a childhood dream when she won her home tournament in Moscow earlier this month, pulling off an incredible comeback to defeat Ons Jabeur in the final. The victory gave her a place in the top-10 for the first time and sent her to Singapore as an alternate for the WTA Finals. With no withdrawals occurring, Kasatkina did not get to compete in Singapore, but she did get to explore the city, do some shopping, and more importantly spend hours on the practice court with her coach Philippe Dehaes in preparation for her last event in Zhuhai. The young Russian, who has her own unique brand of creative tennis, is one of the now famous Generation ’97 that has taken the tour by storm over the past two seasons. She reached the finals in Dubai and Indian Wells earlier in the year, before scooping the second WTA title of her career in Moscow less than two weeks ago. Kasatkina has posted seven top-10 victories in 2018 – only four players have claimed more – and reached back-to-back quarter-finals at Roland Garros and Wimbledon. Her Kremlin Cup title triumph in Moscow of course stands out as a season highlight for her, and she spent the following week in Singapore unwinding from her emotionally-draining run on home soil. “Very, very emotional, yeah a lot of things happened during that week and I’m really happy that I won the tournament I was dreaming to win since I was a kid. It was the last year where they were playing it at the Olimpiyskiy, so it was really special for me,” Kasatkina told Sport360 in Singapore. Kasatkina was down 2-6, 1-4 against an in-form Jabeur in the Moscow final, but yet another magical speech from her coach Dehaes helped her turn things around and win the match in three sets. Their post-victory embrace said it all. “To be honest, I cried a little bit when she came to my arm and started to cry a lot, so I was a little bit shocked,” Dehaes told reporters in Singapore of that moment in the stands in Moscow. “You work a lot during the year. You sacrifice a lot of things. Me, personally, I have family, I have kids and I don’t see them a lot. You work, we went through a very difficult summer. So it’s a lot of hours of difficulties where you ask a lot of questions, and then you have this moment when you win the last point and she win the title. It’s exactly what you expect. Down 6-2, 4-1 down, a despondent Daria Kasatkina called out Philippe Dehaes @tennisrussia. It wasn’t the first time this season where Kasatkina executed an improbably comeback in a high-stakes situation. In Dubai, she saved match points in victories over Johanna Konta and Garbine Muguruza en route to the final. She was two points away from defeat to Venus Williams in the Indian Wells semi-finals but rallied back to defeat the American veteran and advance to the final. “I don’t know, it seems like I won 90 per cent of my matches losing very badly,” admits Kasatkina. She ranks her comeback against Jabeur among “the top three” of her career and is proud of the level of play there were both able to produce. It was a clash described by many as one of the most entertaining of the year, but while it was unfolding, Kasatkina didn’t grasp just how good the match was. “Sometimes you feel, sometimes not. During this match I was very nervous so I didn’t feel it. I was just really so nervous. The only thing I was thinking about was how to come back in this match,” she recalls. “Then my coach came to the court and I came back of course. The match was unbelievable, the scenario of the match was amazing, especially in a final. I think everyone enjoyed it. Kasatkina year-end top-10 position is not officially secure yet as she takes on a stellar field in Zhuhai that includes the likes of Muguruza, Aryna Sabalenka, and defending champion Julia Goerges. “I didn’t finish the year in the top-10 yet. I was happy two days ago but now I kind of forgot about it because I still have one more tournament to go and I’m focusing on it,” she says. While she admits she still has a lot to work on, Kasatkina is pleased with what she’s achieved this season. During this first year of their partnership, Dehaes has wrestled with the balance of preserving her artistic tendencies, while adding discipline to her game. An incredibly emotional @DKasatkina greets her team. “She’s an artist, and for me I see it like this, because she can do crazy things, so she has to keep going to do this. I told her, ‘If you win like an artist, you have to accept to lose like an artist’,” said the Belgian coach. That happiness counts for a lot in Dehaes’ book. He notes that there is still much to improve but commends his charge’s commitment and willingness to put in the work. “There is a big gap in everything. The ranking is great, but I have the feeling that all the weakness she has can be, if she improve them, can bring her much higher,” he explains. “I’m very proud of the commitment she has every day. She wants to play. It’s not easy every day, because it’s a young girl. She’s only 21. She has a lot of pressure. Sometimes it’s quite tough to find the motivation. But she keeps this. She is the leader in this business. She wants to do the job, which is, for me, the most important. “I don’t have the feeling this year that one morning she wake up unhappy to go on court. Australian series was not so good, and then we have a very good period until Wimbledon. And then, also because she increased the ranking, and when you increase the ranking like this, you have to take time to digest a little bit, because she put in her head, okay, she was 11 or 12, maybe I cannot lose anymore against girls between 15 and 20 and 25, which is, it’s not like this, but it came to her head, she started to count about the Masters [qualification points for the WTA Finals] because, hmm, I’m not so far, maybe blah, blah, blah. And then she started to play the match like I don’t want to lose the match. So it was tough for her, this moment. Finishing on a high: Elina Svitolina. Elina Svitolina’s coach Andrew Bettles believes her WTA Finals triumph could be a great launching pad for next season as the Ukrainian appears to have conquered her demons, sending out a major statement at the close of 2018. Following a difficult second half of the year, Svitolina defied all odds by going undefeated at the season finale in Singapore, to win the biggest title of her career. 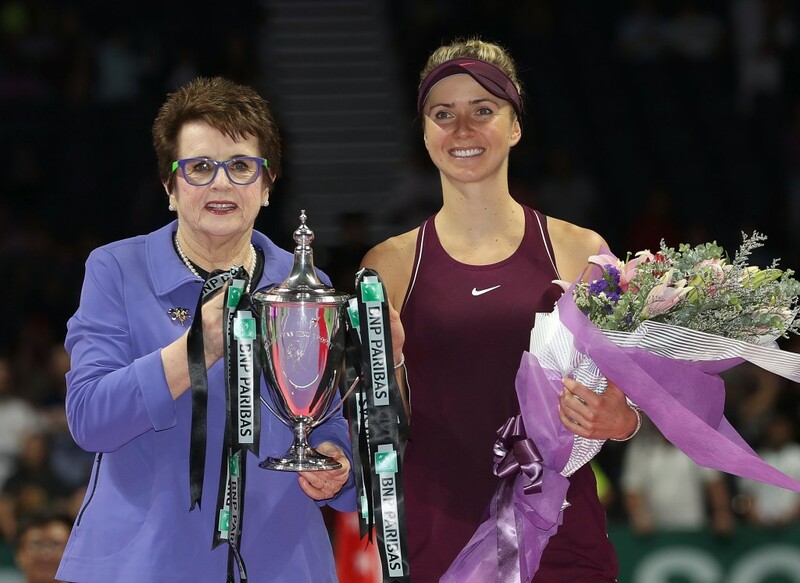 Scooping the Billie Jean King trophy not only silenced her doubters, but lifted Svitolina back into the world’s top-five (she ends the year as the world No. 4). Svitolina was in a tight position before Singapore. She hadn’t secured her qualification spot and wasn’t entered in any tournaments in the last week leading up to the WTA Finals. Her fate was not in her own hands and she had to depend on other players’ results to book her place in Singapore. Ultimately results fell in her favour and she made it to the Lion City. Her coach Bettles is not really sure how she pulled off the title victory after so much uncertainty just 10 days earlier. “I can’t really [explain it],” Bettles told Sport360. Svitolina, whose strong first half of the year saw her pick up titles in Brisbane, Dubai and Rome, spoke openly throughout the week in Singapore about how tough it was for her to deal with the slew of scrutiny and criticism regarding her dip in form and dramatic weight loss. She felt she had something to prove and her WTA Finals success goes a long way to doing just that. Her stats during the tournament painted an impressive picture as she led the field in aces and service points won. “She’s a great player, she went through a little rough patch but that didn’t stop her from being an amazing player. So I think she just got back to her basics a little bit, kind of let all the bad feeling and everything out and she was just free to play and you could see what a great player she is,” explained Bettles. In August, Svitolina parted ways with her then head coach Thierry Ascione. She had the briefest of trials with Nick Saviano in Wuhan but that partnership did not come into fruition. Bettles, who started off as her hitting partner then became her traveling coach, has done a great job with Svitolina, helping her get through the aforementioned “rough patch” and was seen commended by the legendary Martina Navratilova, who greeted him after the final in Singapore. A search for an additional coach will commence during the offseason. “I’m going to have time off, obviously, I think three weeks. I have to settle some issues with my health,” said Svitolina. “Yeah, just go from there. I’m going to speak with Andy [Bettles] and see what are the best options, which coaches are available at the moment, and try to work for some time. Last year, Caroline Wozniacki lifted the WTA Finals trophy then went on to claim her first Grand Slam title in Australia at the start of the 2018 season. Can Svitolina use her Singapore triumph to a similar effect? “Let’s hope so,” said Bettles. In a WTA season of transformations, breakthroughs and surprises, Kiki Bertens checked every box and walks away from Singapore knowing she has plenty to be proud of. The first Dutch woman to feature in the WTA Finals singles event since Brenda Schultz-McCarthy in 1997, Bertens made her top-10 debut earlier this month and finishes her year in a far different position to where she was 12 months ago – not just in the rankings, but more importantly in terms of headspace. Last year, after losing the doubles final in Singapore with partner Johanna Larsson, Bertens contemplated retiring from the sport as she admittedly felt she was failing to find the joy in the sport. Her coach Raemon Sluiter suggested she think long and hard during her subsequent vacation in Bali on whether she believed she should continue playing, or if she was ready to walk away from tennis with no regrets. Bertens, ranked 31 at the time, returned from her break with a sheet of paper that included a short list of things she needed to change in order to keep going. Sluiter was encouraged by the fact his charge was being proactive about her situation and decided to continue their working relationship, after previously considering parting ways with Bertens. 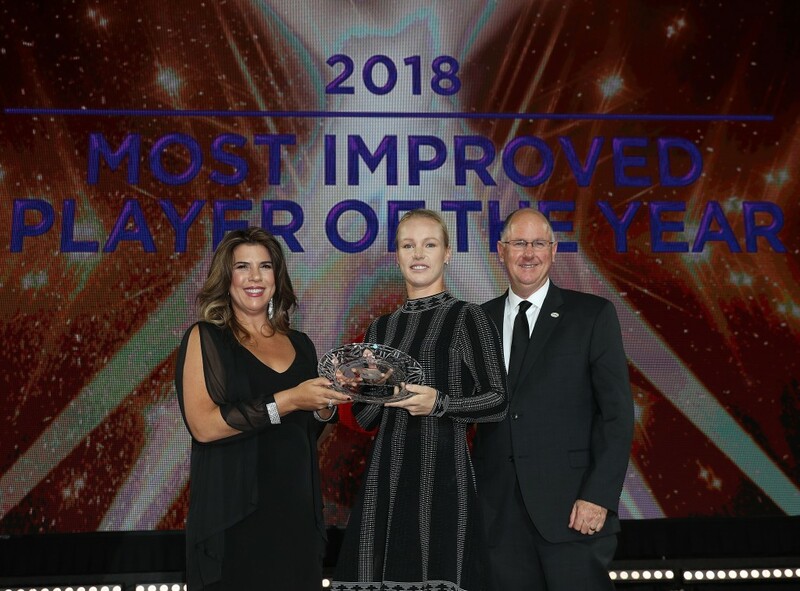 What followed was a remarkable tale of transformation that unfolded throughout the 2018 season and ended with Bertens winning the Most Improved Player of the Year award, before falling in three close sets to Elina Svitolina in the semis of the WTA Finals. A formerly self-proclaimed clay specialist, Bertens, who won the Premier title in Charleston in April on green clay, made a stunning run to her first Premier 5 title on the hard courts of Cincinnati in August. She added a second hard-court trophy to her cabinet later in Seoul. On grass, she reached the quarter-finals of Wimbledon. She also reached finals on clay in Madrid and Gstaad. Translating her success to all surfaces wasn’t the only standout outcome of Bertens’ efforts this year. The 26-year-old posted a tour-leading 12 top-10 victories throughout 2018 – a glaring sign that she developed further belief in her abilities against the very best. “It’s been an incredible season. I can be really proud of myself,” said Bertens following her tight defeat to Svitolina in the Singapore semis. “The only goal we set in the beginning of this year was just try to have more fun, and of course winning is more fun, so that makes it easier. “It sounds maybe strange but the most fulfilling is the way she’s worked this year. Of course there’s still stuff to work on but the way she took the sport as a way of life is remarkable and that’s been a privilege to watch and an outcome of that are great results but to me, it’s even more about that,” Sluiter told Sport360. Bertens credits minor adjustments to her life on tour for her progress this year and her overall positive feelings towards her profession. “I think it’s just some small things. I’m just trying to not think about tennis too much. Like off-court, just doing some more fun stuff. Just walk around in the city. Just go for a coffee and do some yoga, as well,” she explains. The unique format of the WTA Finals isn’t just about its elite top-eight field, it’s also about the challenge of the round robin stage, and how a defeat doesn’t spell the end of a player’s journey. “I would say this tournament it’s almost like a few tournaments in one. Because you have the chance to lose a match and then two days later you play again which is sometimes possible when you’re in the semi-finals or finals of a tournament and then you play next week. It’s a very good format to test acceptance because you get new chances and see how many blows you can take and be back ready to fight. I knew already from Kiki that she can do that. Just still a little bit too hard on herself sometimes,” says Sluiter. The ninth-ranked Bertens, who told Dutch press on Sunday that she is adding physio, hitting partner and coach Elise Tamaela (worked with Aleksandra Krunic this season) to her team in 2019, knows that next season will come with its own set of pressures, but she’s hopeful she can handle it in a positive manner. Sluiter believes it’s better to take the pressure head on, rather than avoid it. “The pressure will come. It’s utopia to think that pressure isn’t going to come. How are you going to deal with it, or how are you going to try to not let the pressure come? The pressure is going to come and there’s nothing wrong with that, you deal with it as good as possible and I think that’s what she’s done already this year,” he says. “Especially the end of the year. It will probably feel good in a few days but she’ll still feel some bruises from the fact that she didn’t get to Singapore herself (she qualified only after world No. 1 Simona Halep pulled out with a back injury). “Like I said, she’s really hard on herself and she can really stick to those things instead of the good things, so that’s going to be the challenge. Although she loves flying under the radar, rather than soak up the limelight, Bertens will have to accept that more eyes will be glued on her moving forward. WTA legend Chris Evert was asked if she believed Bertens could win a Grand Slam. “Absolutely,” replied Evert, an 18-time major champion. Asked if he thinks Bertens feels like she belongs among the world’s top10, Sluiter said: “Yes, for sure, especially with the wins she had over top-10 players and the ranking doesn’t lie. “I think if you ask her she’d say she feels like a top-20 or top-15 player and I think I can live with that. Because if we look at the field in Zhuhai, it’s crazy packed. If I would be a tennis fanatic – well I am, but I need my holiday and Zhuhai is quite far from the Netherlands – but it’s a great event. “There are so many good players, everybody is capable of winning the tournament and I would go one step further that everybody is capable of winning this tournament if they are on a roll. If Julia Goerges is on a roll, if Daria [Kasatkina] is on a roll, if Aryna [Sabalenka], [Garbine] Muguruza, [Caroline] Garcia… it’s a really exciting place at the moment on the WTA tour.